Woke up to another incredibly gorgeous, orange, pink aqua blue sky over my little strip of the San Francisco Bay! Slept in late, sort of. Finally decided to roll out of my comfy sun-dappled bedroom and stroll out to the kitchen. Starving!! Opened up the fridge, took inventory of what we had and made a veritable feast. Grilled sweet potatoes with Yukon golds, nutty toast, fresh local strawberries, scrambled eggs with tons of fresh chopped veggies..we DO like to eat well. All the while, that cute boyfriend of mine made us latte's in his fancy espresso machine. Don't ask me, I don't have a clue how it works. Then out to the deck to dine "al fresco" in our p.j. 's (we are on the top floor - no one really notices us!) Hot sunny, lazy morning. 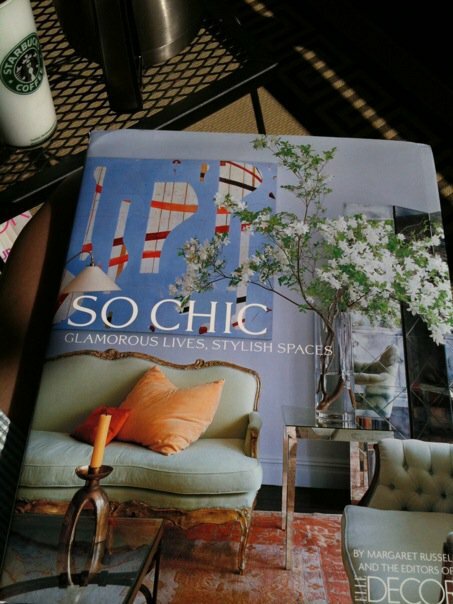 Love these Saturday mornings when I get to indulge myself by catching up on Elle Decor, Coastal Living, House Beautiful, Victoria, Country Living (yeah, I am magazine junkie) and this morning enjoying my latest favorite design book - Elle Decor's "So Chic". getting lost in the inspiring rooms, colors, and design ideas is one of my favorite ways to relax and dream of my next adventure! Of course we had to have a little lunch before walking out on the dunes, it had been over 4 hours or so since our breakfast feast! 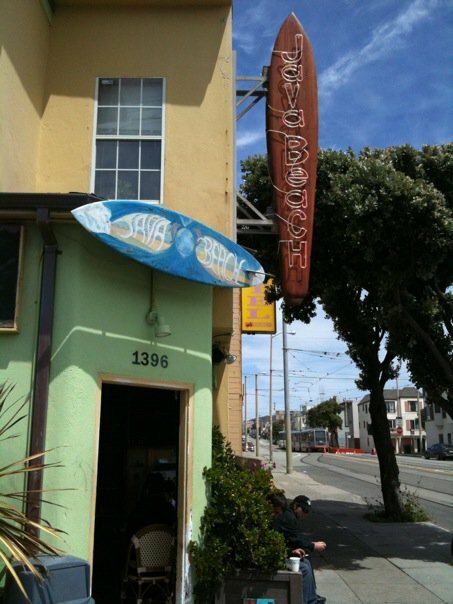 Found a cute cute neighborhood cafe, the Java Beach Cafe - the place was packed! We ordered turkey pesto sandwiches and found a place on the lanai to eat. 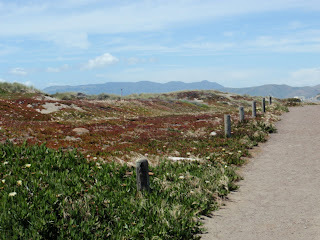 Then over the dunes we went. 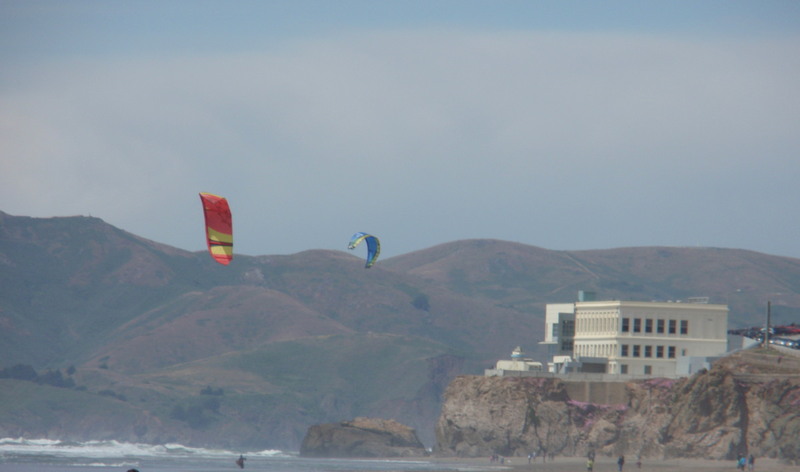 We've never walked on the beach here, have only driven by along side on our way home many times, after enjoying the view at the Cliff House. 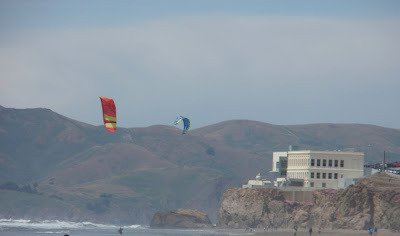 Oh.. the Cliff House... that's a story for another day. 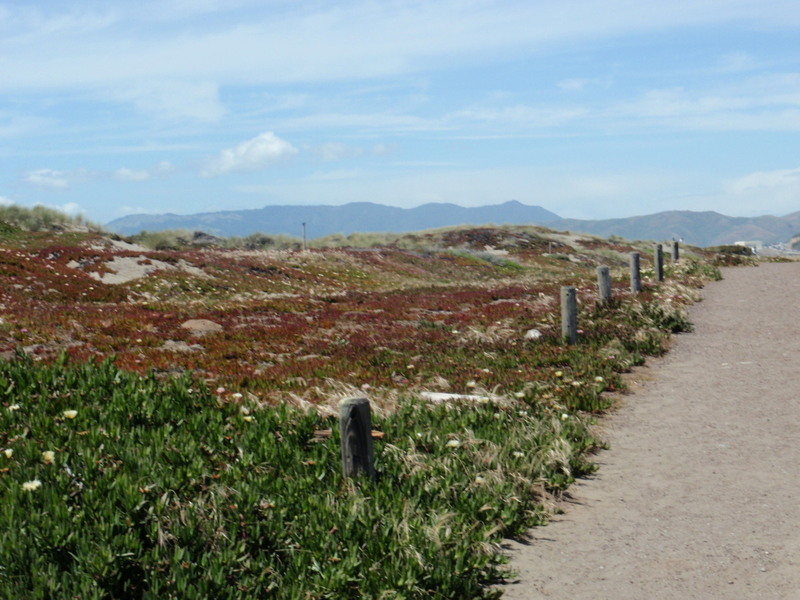 The beach that runs this stretch of highway is a great place to walk, beach comb for shells, hunt for sea glass, build sand castles, and of course, to people watch. We did find a few shells, lots of broken sand dollars, or as Tom was referring to them "half-dollars". 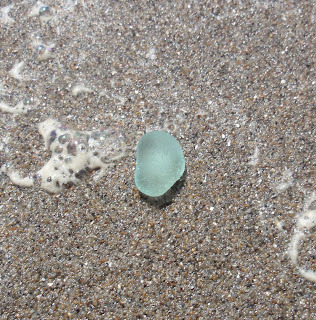 Jellyfish were all over the place too (yuck). 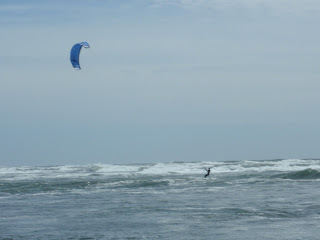 I always admire the kite surfers! 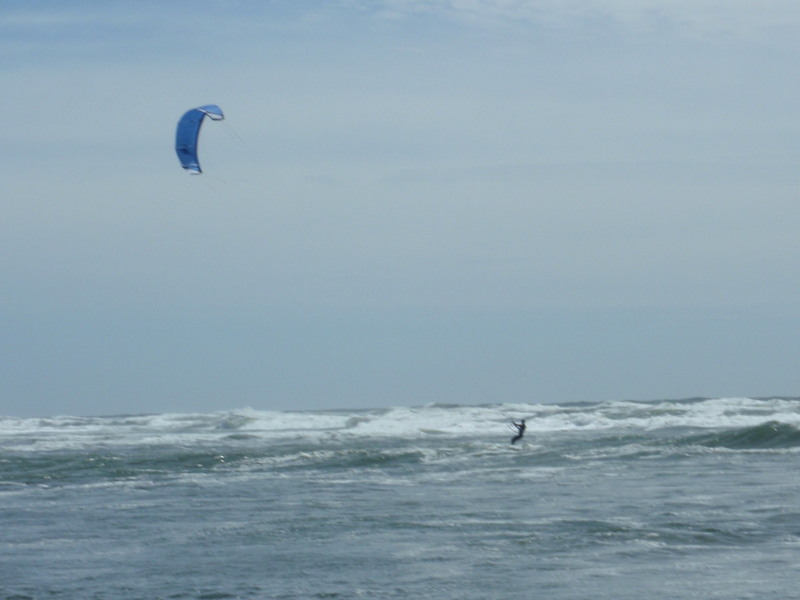 Looks like so much fun, but looks way too cold, and way too hard for this beach girl! 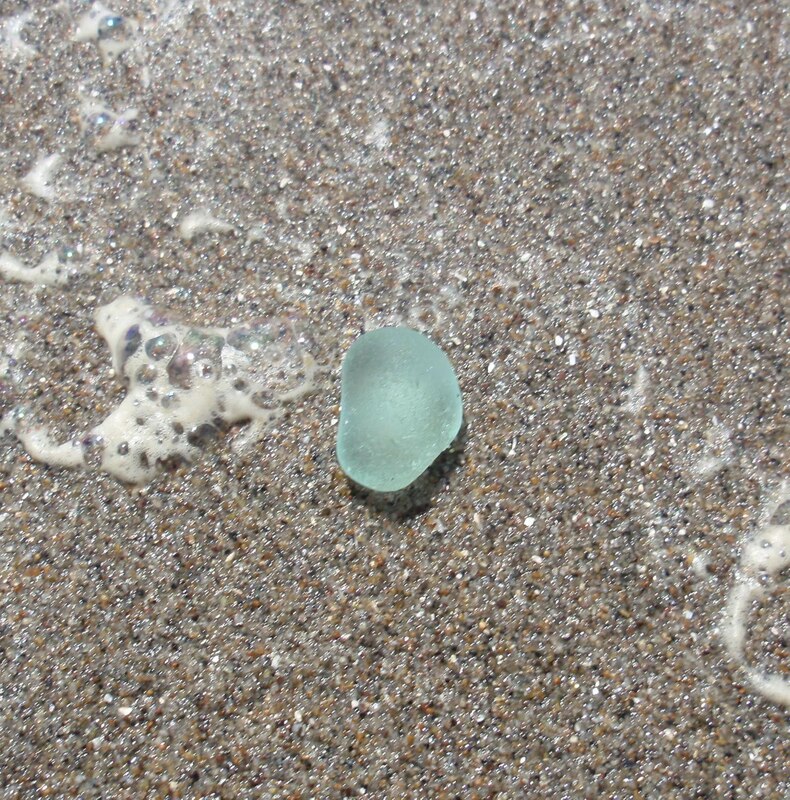 Check out one of my pretty glass pieces (and sand!) 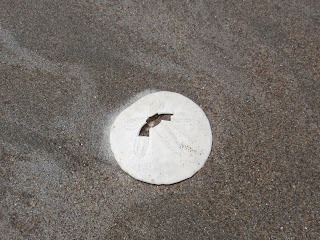 that made it home in my pockets.. Actually, Tom may have found this round smooth aqua piece. Beautiful color reflected in the sun..
Can't wait to go back again when we have more time! Your beach walk sounds nice. We have rain here today so not much happening. What a lovely way to spend a Saturday! Thanks so much for stopping by my blog. My pleasure to meet not only a fellow water maven but a store with some similar and some the same items.